M.E. Vaughan was born in England on the 15th of September, 1992 under the f ull name ‘Madeleine Emily Vaughan’. In her life-time she has lived in an assortment of countries across Europe, the Middle & Far East, as well as a family home in Horsham, built in the middle of a dragon forest. During these travels she discovered a passion for stories which went on to encourage her to overcome problems with dyslexia and pursue her dream of writing. In 2011 she undertook a Creative Writing degree at the University of Winchester, for which, in 2014 she received a 1:1. 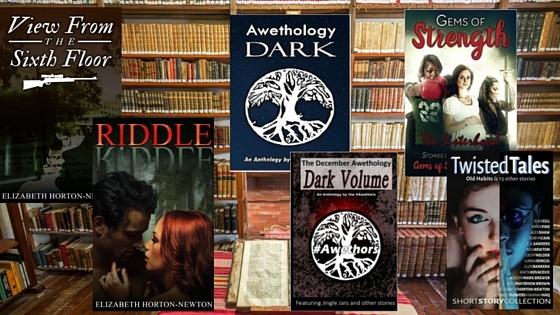 During this time, her short story The Seas Own was published in an anthology by Zharmae Publishing Press, who went on to pick up her trilogy The Harmatia Cycle. 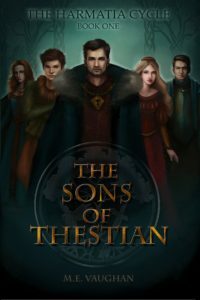 The first book The Sons of Thestian was written when Madeleine was 17, and was published in 2015. Accomplishments: When Madeleine isn’t writing, she enjoys composing, drawing, reading and practising Washinkai Karate, for which she is a 1st Dan. 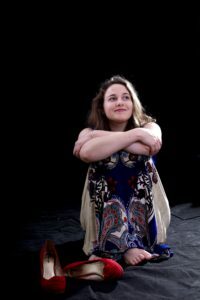 She leads the local Folk & World Music Choir, runs Creative Writing workshops for Children, and is currently undertaking a PhD at the University of Winchester. The Prince Jionathan is plagued by visions of death. With the King on his death-bed, and the tyrannical Queen in power, the Kingdom of Harmatia lies in peril. Fleeing the city in fear of his life, Jionathan is shadowed by Rufus Merle, a young, secretive magi tasked with bringing him home. Now, with the help of a fearsome sidhe warrior named Fae, they must traverse a dangerous faerie-wood together. Against bandits, faeries and cursed priestesses, these unlikely friends travel a path fraught with danger, not least from the blood-thirsty Night Patrol and the dark conspiracy that shrouds them. In the same way that a musician absorbs and reconfigures the influences of other players and bands, The Sons of Thestian synthesizes a wide array of influences from Medieval Arthurian legend and Celtic folklore to more recent classics of the fantasy genre such as The Lord of the Rings and the Game of Thrones and Harry Potter series. As the first novel in Vaughan’s Harmatia Cycle, this novel begins a saga that has the same degree of scope and resonance as so many that have come before it, but Vaughan’s own alchemy integrates her influences into a result that feels completely fresh and also serves as a reminder of why a fantasy epic can inspire such devotion in readers. 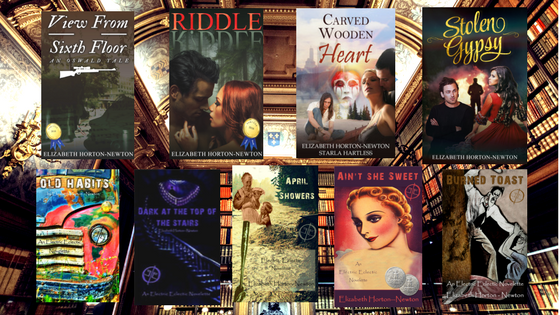 The most enduring examples of the genre create a world so rich with imagery that you don’t want to leave, a cast of characters so textured and engaging that they begin to feel like old friends. In building the world of Mag Mell and by giving us such layered characters as Prince Jionathan (pronounced Yo-nat-han), Rufus the Magi, Fae the Sidhe, and a host of others, Vaughan has created an epic that is endlessly absorbing, even addictive. The plot unfolds with a dying king, a plotting queen, dangerous wizards, and a prince on the run—either away from his destiny or toward it. 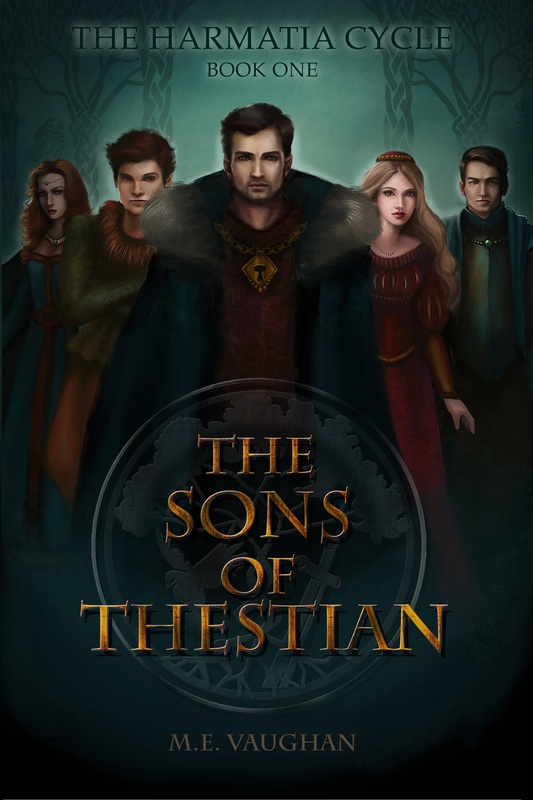 As King Thestian lies on his death bed, the young Prince Jionathan flees the city and kingdom of Harmatia, fearful of the king’s first wife Queen Reine and the machinations of a group of rogue shape-shifting Magi known as the Night Patrol, who justify murder under the guise of keeping the city streets safe. The prince also carries with him the heavy burden of the assassination of his older brother, Sverrin (pronounced Suh-ver-in), the former heir to the throne. The king and queen, along with Jionathan’s mother Eliane, send Rufus, a young Magi with heavy burdens of his own, to find the prince and bring him home. Rufus easily catches up with Jionathan in the forest beyond the city, and he and the prince forge a close but uneasy bond as the pair tumble from one dire circumstance to the next. While on the surface, the novel appears to be a classic hero’s quest, but the series of double-crosses, triple-crosses, and twists make it difficult to pin down exactly who the heroes and who the villains truly are, breathing new life into the standard quest narrative. Even with the vast scope, and high page count, the book is tightly written—chock full of gripping battles and action sequences, quiet romantic moments, and dangerous confrontations with fearsome creatures. The pacing of the action is quick and no detail is insignificant, building to a conclusion that will leave the reader breathless and wanting more. View the Brain to Books Blog Tour Giveaways here!